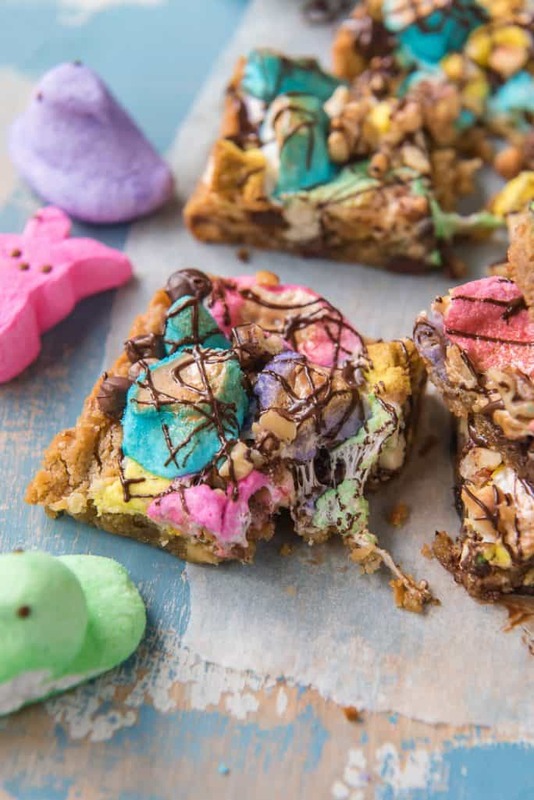 Satisfy your sweet tooth with one of these Springtime Rocky Road Blondies! 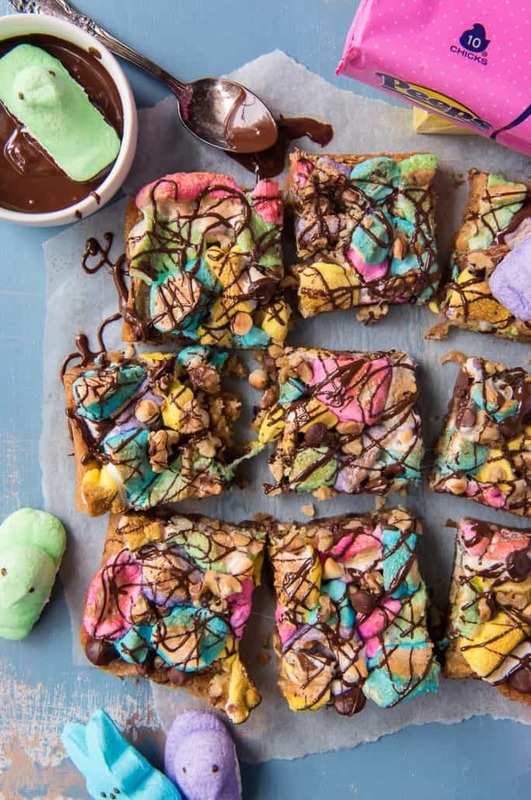 This standard gooey, rich blondie recipe is taken up a notch with the addition of triple chocolate chips, walnuts, marshmallow PEEPS, and a chocolate drizzle. Ahhh I bet you thought #SpringSweetsWeek was all done on Friday, didn’t ya? I wanted to try something different, and I wracked my brain trying to come up with something that was (1) easy, (2) appealing, and (3) pretty. Since the best recipe using marshmallows is, in my opinion, rocky road, I decided on mixing it up with a blondie recipe I’ve been playing around with. Et voila, here we are! 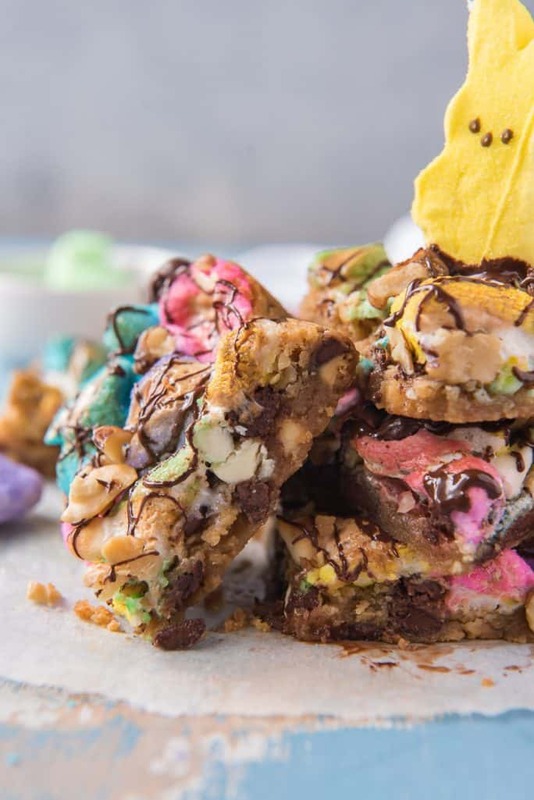 JUST TAKE ME TO THE SPRINGTIME ROCKY ROAD BLONDIES ALREADY! If you’d rather skip my (pretty darn helpful) tips and tricks, essential cooking info, and similar recipe ideas – and get straight to this deliciously easy blondie recipe, just scroll right on down to the bottom of the page where you can find the printable recipe card! This isn’t what it looks like. 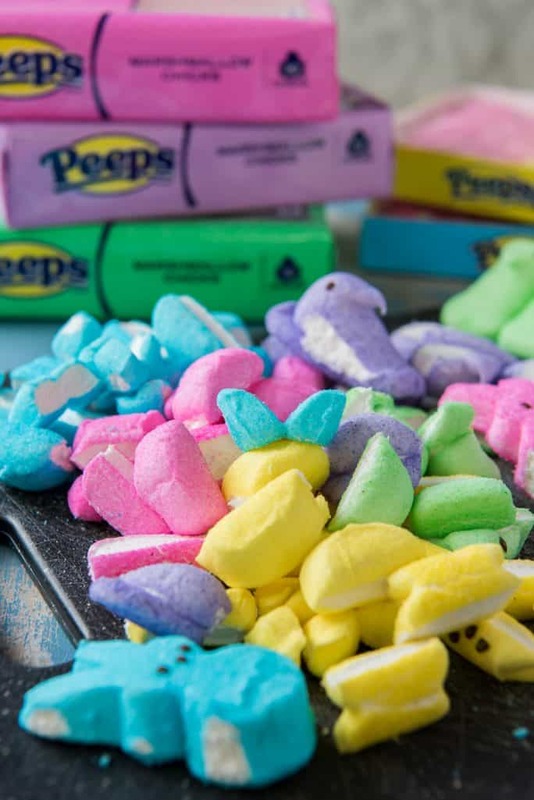 No PEEPS were harmed in the making of this recipe. So blondies. I’ve been trying to come up with a unique version of them over the last few months or so. If it weren’t for baking science, I would have landed on it already! I have gone through SO MUCH butter and brown sugar, you guys. It’s heartbreaking. This is the best blondie recipe I’ve come across as a base to work with. I cut a normal sized batch in half to make room for all the rocky road toppings. 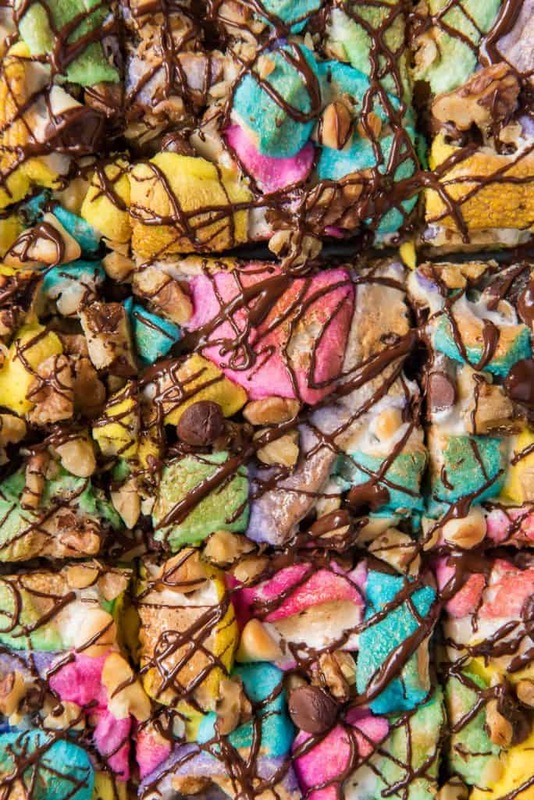 One thing to note is that these rocky road blondies are VERY SWEET. 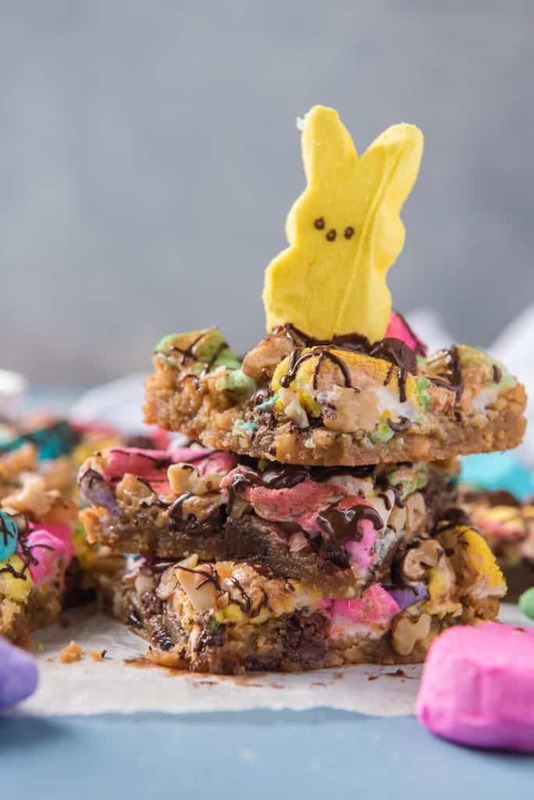 Blondies are sweet as it is, but adding those sugary PEEPS, three kinds of chocolate chips, and a drizzle of chocolate take them over the top. One small square of a batch of these will be more than enough for even the sweetest sweet tooth – meaning your kids are going to love them! What Is The Difference Between A Brownie & A Blondie? A blondie is essentially a brownie minus the chocolate! Seriously, brownie and blondie recipes are very similar. They are sometimes called “blonde brownies” for this reason. The flavor profile of a blondie is sweet butterscotch, since it contains all brown sugar and vanilla. Butter is better. I like to live by this concept in life, but especially in baking. Using melted butter in any blondie recipe keeps them super soft and chewy. Using oil (or a fat substitute) will cause you to lose that delicious buttery flavor blondies are known for. Add mix-ins…or don’t. Blondies are great with chocolate or butterscotch chips, nuts, and crunchy candies mixed in! They’re equally tasty plain, so it’s up to you how you jazz them up. Double up. Looking for thicker blondies, or a bigger batch for a large crowd? Double the recipe. If you’re going for thicker, use the same 8×8 pan and increase the bake time a bit until they’re completely baked but still gooey. If a bigger batch is your goal, use a 13×9 pan to retain the even blondie to topping ratio. First, preheat your oven to 350 degrees F. Line an 8×8 cake pan with parchment paper, spray it with baking spray, and set aside. In a medium bowl, whisk together the cooled melted butter and brown sugar. Add the egg, vanilla, and salt and mix well until well combined. Then, using a spatula or wooden spoon, add the flour and mix well. About 40-50 strokes will make your batter thick – it should be pulling away from the sides of the bowl. Fold in ½ cup of mixed chocolate chips. You can also add nuts if you’d like more crunch. Next, transfer the batter to the prepared pan and bake for 18-20 minutes, until the top is golden brown, and the middle is just barely set. Do not over-bake, since they’re about to go back into the oven for a quick round two. Carefully remove the pan from oven. 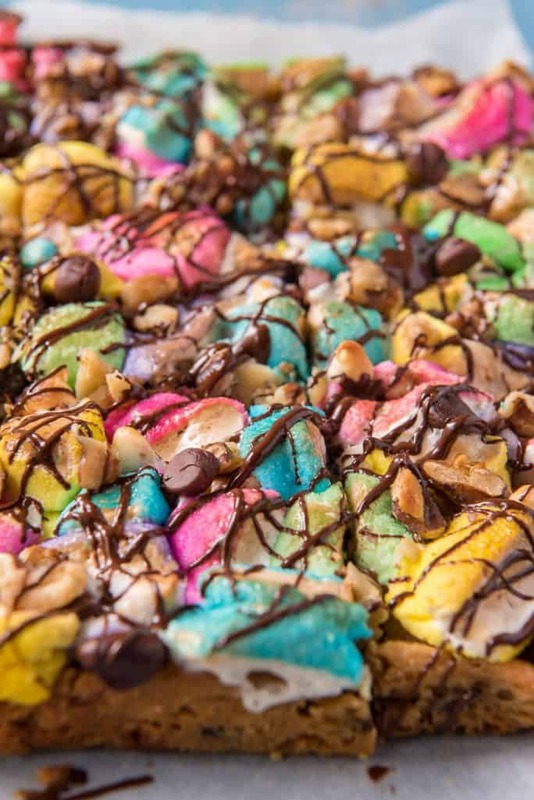 Sprinkle the top with the remaining chocolate chips, then pile on the chopped Marshmallow PEEPS and walnuts. Return the pan to the oven and bake until the marshmallows are slightly browned and puffy, 5-8 minutes. You can also broil for 1-2 minutes on high if you’d like to further melt the marshmallow. Finally, allow the blondies to completely cool in the baking pan before removing from the parchment paper and cutting into squares. Drizzle the top with melted chocolate if desired. Cover the blondies and store at room temperature for up to 3 days. LOOKING FOR MORE SPRING DESSERT RECIPES? Preheat oven to 350 degrees F. Line an 8x8 cake pan with parchment paper, spray with baking spray, and set aside. In a medium bowl whisk together the cooled melted butter and brown sugar. Add egg, vanilla, and salt and mix well until well combined. Using a spatula or wooden spoon, add the flour and mix well, 40-50 strokes, until batter is thick and fully combined. Fold in ½ cup chocolate chips. Transfer batter to prepared pan and bake for 18-20 minutes, until the top is golden brown, and the middle is just barely set. Do not overbake. Carefully remove from oven. 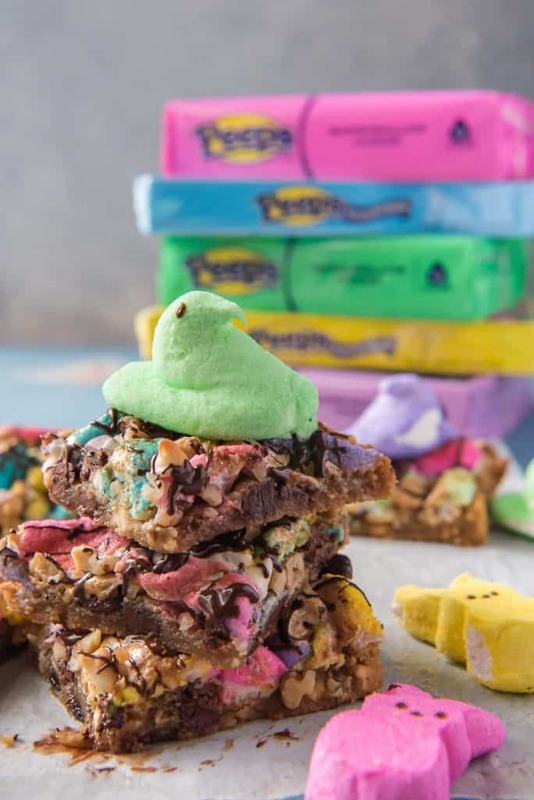 Sprinkle with remaining chocolate chips, then pile on Marshmallow PEEPS and walnuts. Bake until marshmallows are slightly browned and puffy, 5-8 minutes. You can also broil for 1-2 minutes on high if you’d like to further melt the marshmallow. Allow the blondies to completely cool in the baking pan before removing from the parchment paper and cutting into squares. Drizzle with melted chocolate if desired. Cover and store at room temperature for up to 3 days. Blondie recipe adapted from Smitten Kitchen. 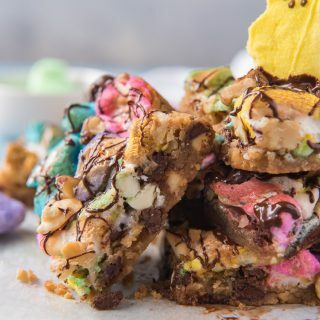 PIN THIS ROCKY ROAD BLONDIE RECIPE FOR LATER! I love blondies! You have all the good stuff in here! Peeps put these over the top cute!